Are you a bit of a hippie? If you consider yourself a boho bride and want something a little different for your wedding flowers- I absolutely love playing with flowers this way. I loved working with all the textures and interesting alien looking foliage I was able to use for this boho bridal bouquet. Juniper Hills is a new wedding venue on Camano Island owned and operated by the sweetest husband and wife. It's beautiful and if you are looking for a venue I highly recommend you check it out. LCM Weddings and Events worked her wedding planner magic on this one and I highly recommend her too. Rosehips and mini calla lilies add a touch of Christmas to this winter bridal bouquet. The dusty miller adds a frosted look while the roses and ranunculus bring their frilly fullness. I love the creativity of my job- I love how each project and wedding is completely different. And each time I feel like "this one is my new favorite". I love the inspiration and collaboration I have with my brides and the people I have met doing styled shoots. It's 2016 and I'm feeling lucky and happy. The Admiral's House sits on a hill facing the water in the Magnolia neighborhood of Seattle. With it's sweeping views and classic architecture it was a natural setting for a fairy tale Christmas wedding shoot. Earlier this fall I created the floral design for a photo story and cover of the first wedding issue of Afroelle Magazine. There were multiple dresses by the very talented Dream Dresses by P.M.N. on this shoot so I created three bridal bouquets in the same color scheme. The third one was chosen for publication but I love them all equally. Lilac and Lace provided all the sweet details and styling and Nuflours made the delicious (and gluten free!) cake. 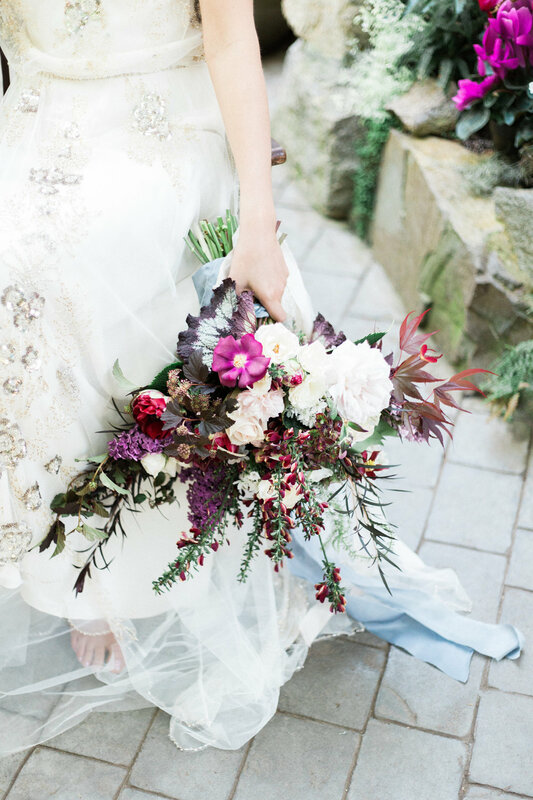 I am very excited to share the photo shoot I did florals for with Kerry Jeanne Photography . Last month it was featured on Green Wedding Shoes and for me it was truly a dream team collaboration. Way back in the spring I was asked to do the flowers for a photo shoot for the first issue of Rock Bride Magazine. I am so happy to be able to share the beautiful images captured by First Light Photography on that very wet day. Samantha from Wild Spirit Events worked her wedding planner magic with all the details. I recently worked on a photoshoot with the super talented photographer Kerry Langel. I can't wait to show off all the beautiful images but in the mean time here is a quick glimpse of the day. Here are some pictures of flowers I did for a baby shower earlier this month. Little projects like this are so fun and satisfying- instant gratification. If you're having a party or shower and need flowers please contact me. I made the vases a while ago and felt very ho hum about them, but I really liked them once they were filled with flowers. I have been heading to the ceramics studio a lot this winter and it's nice when I can bring my two loves together. Last month I had the pleasure of designing the flowers for a bridal photo shoot put together by Wild Spirit Events. Not far from Seattle just a little bit past Issaquah there is the most magical place. Tree House Point is straight out of a fairy tale. Of course it was wet and cold but there is no denying the beauty of the Northwest when you look at these photos by Luma Weddings.